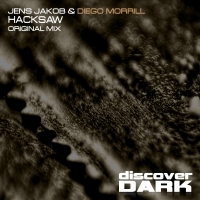 With a name like Hacksaw, you have every right to expect something on the darker side of the trance spectrum and Jens Jakob, Diego Morrill do not let you down. Hacksaw is packed with cross genre infuences all of which sit together perfectly to create a tech trance masterpiece that drives along with pace and class and an energy that does not relent for a second. Top work from this talented duo!! 'Hacksaw' is available now from Beatport and iTunes.